Bijapur is a medieval city of Karnataka, still glorious with its astounding forts, marvelous palaces and sprawling meadows. As you step in the city palaces and forts, you are on a time machine back to the fairytale city of the kings and queens. One of the must do activities at Bijapur is exploring the heritage sites. 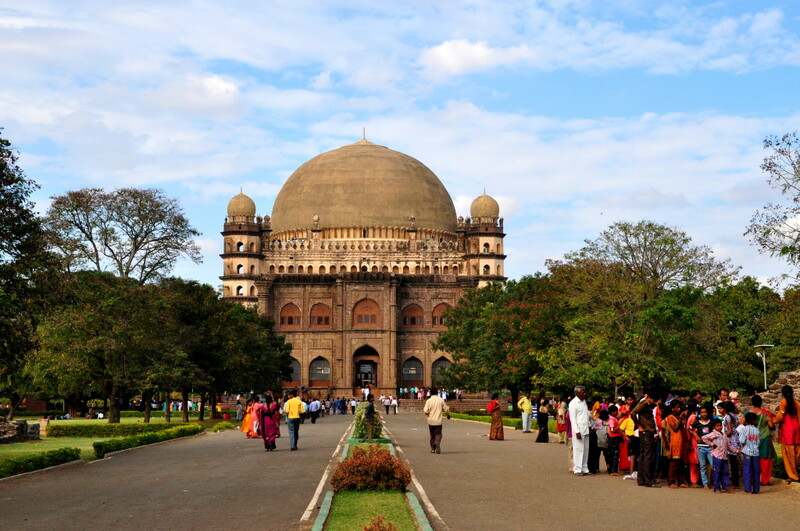 GolGumbaz should top your list of sites as this mausoleum comes with the second largest dome of the world. With 51 meters of height and 18000 meters of width, this is one of the most spectacular mosques of the world. The Whispering Gallery is another wonder of the mausoleum; how low you may speak, the sound can be clearly heard within the hall. Visit Ibrahim Rauza to check out the mosque that inspired Emperor Shah Jahan to build Taj Mahal. An exquisite example of Persian architecture, Ibrahim Rauza is built out of a single rock piece; the decorative windows, carved arches and stone embellishments enhance the beauty of the mosque. Malik-e-Maidan attracts visitors with its 55 tons of weight and 4 meters of length. It is the largest mounted cannon in the world. It is believed that the gunner had to dip in a water tank to protect his ears from the thunderous sound of the cannon. Jami Masjid is another amazing piece of architecture, the largest mausoleum of Southern India. The interiors of the mosque are magnificent with murals and paintings. Climb the 24 meters UpliBuruj to get a birds’ eye view of the city of Bijapur. The Gagan Mahal or the Sky Palace is a unique palace built in the 16th century by Sultan Ali Adil Shah. While the ground floor comes with an assembly hall, the upper floors serve as residence to the royal family. Bijapur, the land of sultans is also known for its authentic delicacies. North Karnataka food is the specialty of Bijapur. Vegetarians will love the taste of bhakri, a kind of roti prepared from jawar or bajra flour. While ennegai, a badanegayi bulb stuffed with ground peanut, sesame, ginger, garlic and spices energizes you, the tangy ellu chutney, kempukhaara is perfect as end dish of lunch. The salads of mosarubhajji, raw salads and saaru are both healthy and tasty. Bijapur is a shopper’s paradise. While the hand woven IIkal sari is a dream wear for any women, the elegant Lambani and beaded jewelry are perfect matches with these gorgeous saris. The coin jewelry and jewelry made from copper, white metal and silver are also famous at Bijapur. Bring back a piece of Bijapur with extraordinary handicrafts like sandalwood items, stone items and beautifully painted jute bags. Bijapur is easily accessible via air, railways and roadways from any part of the country. By Train: The nearest railway station is the Bijapur railway station. It is well connected to Mysore, Pune, Bangalore, Mumbai, Hyderabad and Hubli. By Road: You can get around the city in horse driven tongas, auto rickshaws and local buses. The national highway NH- 13 runs through the city and hence it is well connected to Mysore, Bangalore, Pune, Hyderabad and Hubli. Hence make this vacation special with a trip to Bijapur, one of the heritage cities of the country.